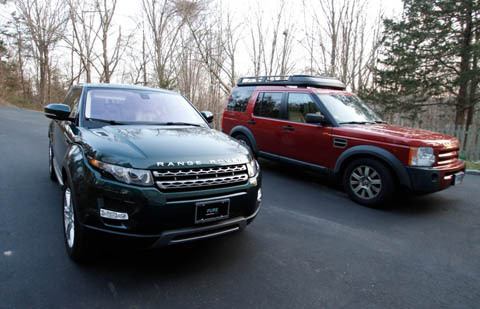 Top Range Rover Evoque and Land Rover Discovery—there’s huge contrast but still a family resemblance. Above Shades of the 1970 Range Rover at this angle. As anyone knows, Mondays tend to be sort of blah. But I had an unexpected treat this morning, dropping off my wife Suzanne’s Land Rover LR2—Freelander to most of our readers—for a quick software upgrade. That’s when things took a turn for the better: Land Rover Milford’s service manager, Ken Krischtschun, offered me a car rather than a ride back to my studio: a new Range Rover Evoque, in deep green. It has such a presence, and the appearance is very concept car-like—not surprising since it follows the template of the Land Rover LRX show car from several years before. Land Rover was wise to keep close to the concept in a very fashionable segment and not tone it down, because the result is a vehicle that is the hottest for anything bearing a Rover tag—Land, Range or otherwise—since probably the SD1. There is nothing like it on the road, and while it’s not what I call a traditional Land Rover, it’s still recognizable as one of the family. I have been driving Land Rover products for over 10 years and this was going to be a true shake-down with prejudice. I have been driving off road in my Discos and now my LR3 (Discovery 3). This seemed more suited to the city, unsurprising given Range Rover’s Sloane Ranger market for the Evoque. It wasn’t long ago that Lucire was covering the launch and Land Rover’s announcement that Victoria Beckham had been appointed a design consultant for the firm, and we know that she wasn’t hired to make the cars more appealing to the farmer and safari audience. Opening the door, I was treated to an amazing cockpit. It could even be called futuristic: the skylight extends from just above the front passenger compartment to nearly the liftgate. The seats are lower than I expected, which made me a bit uneasy after driving the Discos. The side glass extends clear to the rear passenger area. The waistline is also high, making the windows smaller compared to the huge one I am used to. Once I had adjusted the driver’s seat to my liking, I found the feel of the wheel and placement of the controls to be so similar I was at home in an instant. The front seats are generously bolstered, giving you a feeling of being cradled in a snug-fitted custom seat. The bolstering would come in handy as I found out later while taking curves at speeds I would never do in my LR3—but maybe in the LR2! The only thing I did notice from the ergonomic viewpoint was the side view mirrors are too large for the relatively shallow windows. They created two troublesome blind spots. The mirrors could easily be half the size and not compromise safety. Conceding to modernity, the Evoque’s smart key is cool: just have it on your person and the car stars with a simple button push. It starts briskly. Considering our test car was a four-cylinder turbo, the mufflers gave it a great deep sound. The centre console treats you to the shift selector, a dial, literally rising to the occasion. The very smooth surface of the console with the shift dial capped in gloss black and trimmed in a steel, screen-like finish is super cool! Unusually, it also has terrain response settings just to the rear of the console, although the only rough terrain I would take the Evoque on would be Wooster street in Soho! The centre console also had an amazing display panel for nav, sound system functions and phone, as well as the usual time and temperature. The Evoque syncs with your Ipod in an amazing way, but until you get used to it, I suggest selecting your playlist before heading out: it displays your entire Ipod playist, and mine is extensive, so the distraction could be very bad! When I finally pulled out into traffic, right off I felt how quickly the engine wants to get up and go. Acceleration is responsive, with a smooth transfer of power. The automatic gearbox shifts effortlessly. After driving around on the surface streets and a quick stop at the studio to get a camera, I decided to hop on the interstate and have some fun. 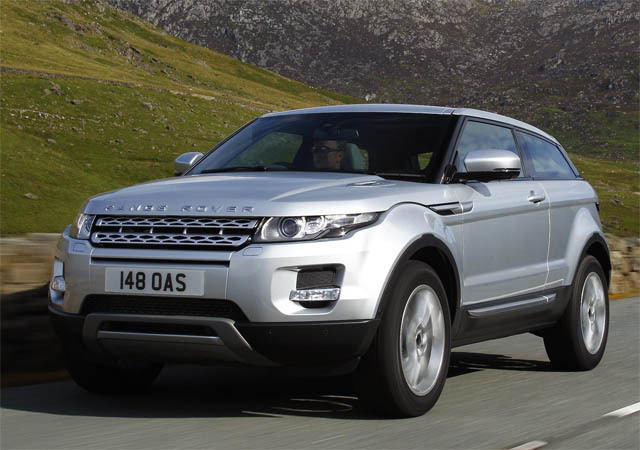 The Evoque quickly raced up to highway speed with no turbo lag: instant power when you asked for it. In a few seconds I was cruising at over 70 mph. Since the feel of the wheel and components were so familiar, I decided to just drive like I had somewhere to be—in a hurry! The steering response is so sharp that the car inspired confidence when changing lanes at speed on a heavy and fast three-lane highway, to the point where I felt like the other cars where moving pylons. I essentially used them as gates like an alpine skier would. On a private road, the Evoque managed to accelerate from 70 to just under 100 mph in seconds, so quickly I was hit with an adrenaline rush! With Nine Inch Nails cranking out of the amazing sound system, I was in heaven. Braking was very responsive, slowing from over 90 to 60 without a sweat. The transmission sensed this and responded in kind. It allowed re-acceleration like it was being shifted by a trained race car driver. The Evoque comes equipped with paddle-shifters, but the settings of the gearbox are so good that one would seldom need them. I also took the car out to my neck of the woods, literally! We live in the Litchfield Hills in Connecticut. Our roads are very rolling, going from downhill sweeping curves to instantly straights back up, curving the other way. This was a great test of how the Evoque handled country driving. Thankfully, we have very well maintained roads with limited bumps, allowing me to test the car on windy roads. 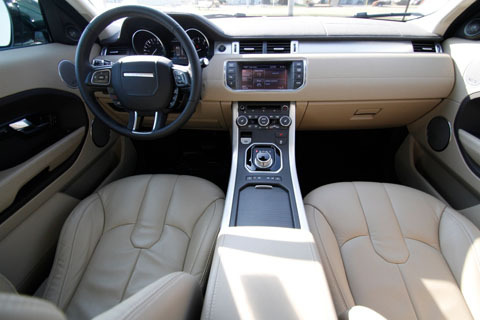 Just as easily, the Evoque braked and down-shifted intuitively, handling the terrain capably. I loved how quickly it accelerated out of curves to get back up to speed, climbing a curving uphill stretch of road, without a bit of resistance. Overall, the Evoque is a very fun vehicle to drive, with decent space, comfort and design that I would label beyond beautiful, both inside and out. It was quite a contrast to my LR3 when I parked them side by side at home. The Range Rover Evoque is so forward-looking technologically and in terms of æsthetics, it is hard to imagine what Land Rover will bring to automotive design in the next few years. Stephen Ciuccoli is Lucire’s New York photographer. 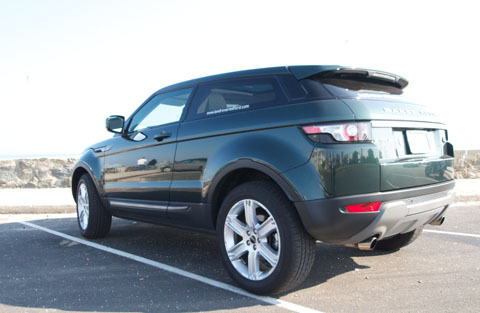 Get quick facts on the Range Rover Evoque and other models at Autocade.